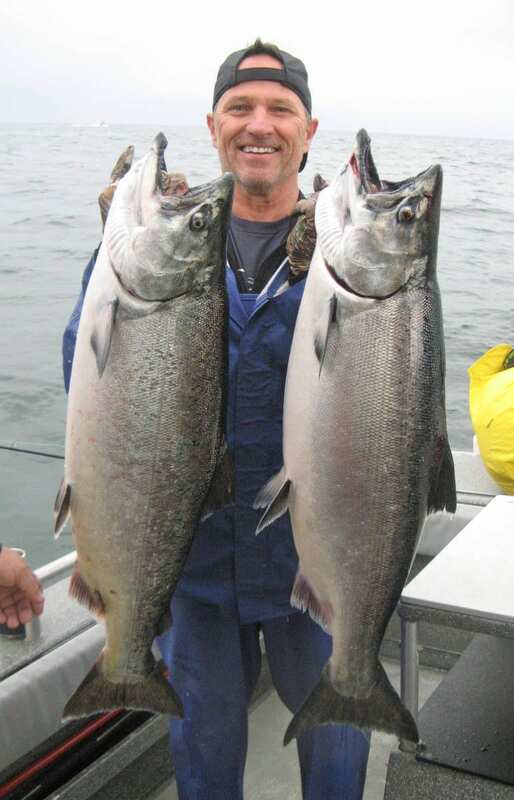 Season: Chinook salmon (kings) fishing begins in late April or early May. The run builds through the middle of May and remains at a very high level throughout June. Expect a brief drop in abundance on July 1 with the commercial trolling opener, then the numbers kick back up by mid-month. Strong numbers of kings generally stick around until at least mid-August. Size: Average chinook size ranges 22 and 25 pounds. 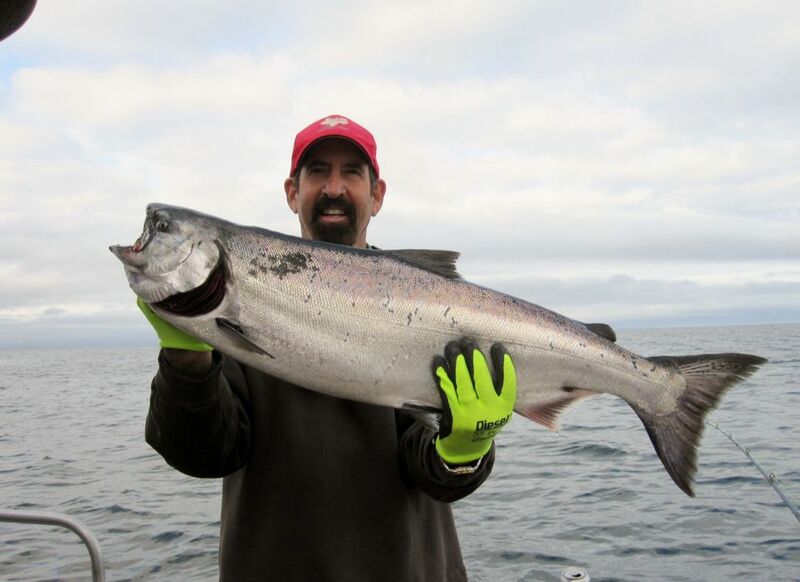 Fish over 30 pounds are not rare and kings over 40 earn bragging rights. The rare air for kings – like fish of a lifetime – begins at 50. We’ve seen a handful of kings over 60 pounds over our 17 years in Sitka. The maximum known size of a chinook salmon is 126 pounds measuring 4 feet 10 inches long. The biggest sport caught fish we’ve heard of from Sitka waters was 82 pounds. The world record king was caught on the Kenai River and weighed 97 pounds. Techniques: Angling Unlimited has a “hands-on” fishing policy. You hold the rod, you feel the bite, and you hook the fish. Our method is mooching which includes motor mooching, drift mooching, and anchor mooching. You can also jig for kings and we’re working hard to develop salt water fly fishing for kings (stay tuned for results in 2010). Also, we’ve begun catching kings with artificial baits like Berkley Gulp rigged on circle hooks. Rigged with either plug-cut herring or Berkley Gulp, circle hooks allow for catch and release king fishing with very low levels of hooking mortality. Gear: Mooching is delightfully uncomplicated from a tackle perspective. We begin with top of the line G.Loomis rods ranging from 8’6” to 10’6” in length – your pick. We pair that with a Shimano Tekota 500 LC, which features a line counter so you know the depth of your gear all the time. We spool the reel with Berkley Big Game 20 pound test – bright green. We use sliding weights from Metzler. We tie our leaders with 30 or 40 pound test Berkley Big-Game or Berkley Vanish Fluorocarbon and the world’s sharpest hooks from Gamagatsu. We also use circle hooks form Daiichi and Owner when catch and release is the priority. For bait, we use a plug-cut herring 99% of the time, but we’re developing a growing interest in artificial baits, specifically Berkley Gulp. Want to learn more about King Salmon? Well, here you go! Kings range naturally around the Pacific Rim from California to Hokkaido. They have been transplanted all over the world including the Great Lakes, Chile, and New Zealand. Chinook tend to migrate near to the shore and cover fairly long distances north and south. Many of the chinook caught in Alaska originate in Oregon, Washington and British Columbia. Hot ocean fishing for kings can occur as far south as Los Angeles and as far north as Nome. Chinook are the biggest of the Pacific salmon, historically reaching a maximum weight of nearly 130 pounds and a length of 5 feet. Modern day kings aren’t that big, averaging around 25 pounds at maturity. The life span of a king can be anywhere from 3 to 7 years. The longer lived fish tend to be larger. Prior to damming, the Columbia had an annual return of 12 million kings migrating in from late January through the end of November. The fall chinook spawned primarily in the main river, while the spring and summer chinook spread into the tributaries to drop their eggs. Unfortunately, the fall chinook lost much of their spawning ground to the dams and the runs have become largely dependent on hatchery production. The amount of genetic variation in kings seems nearly endless. Aside from moving into rivers at all times of the year, they also spawn anytime from July through December. Some young chinook can hit the salt chuck with the yolk sac nearly intact while others live in fresh water for two years. Returning adults spend from one to six years in the ocean. Chinook vary in size from river to river. The Kenai is known for its giant kings, as is the Skeena in British Columbia. Washington’s Elwha River was once home to a race of pound kings that reached weights of 100 pounds, but two dams blocked migration to and from the spawning grounds. Juvenile king salmon dine a wide variety of zooplankton and small fish when they enter salt water. As they grow, their diet remains focused on euphausids (krill) and shrimp, but they also dine heavily on herring, anchovy, sand lance (needlefish), eulachon (candlefish), and any number of other small fish. Kings grow rapidly at sea and store large amounts of fat (oil) in the flesh in preparation for long upriver migrations. The high oil content makes them highly desired on the table. Their incredible power and stamina makes them highly prized as sport fish.